Lady Byng, left with husband Lord Byng, first recognized sportsmanship and gentlemanly conduct in hockey in 1925. Earlier in the NHL season, I wrote about Brian Campbell and his chance to win the Norris Trophy for the National Hockey League’s best defenseman. Campbell had an outstanding regular season this year for the Florida Panthers and was exactly the top level defenseman that the team needed. Campbell had 4 goals, 49 assists, and 53 points. His 53 points were good for second among all defenseman during the regular season, and his 4 points so far in the postseason are also good for second. He also lead the league in time on ice during the regular season. Perhaps most importantly, he keyed a vastly improved power play. This season the Panthers had the seventh best power play in the NHL as compared to last season in which the Cats were last. Obviously, Campbell finished the season with very impressive statistics and should be considered for the Norris Trophy when the nominations are announced on Thursday. Today though, it’s not Campbell’s stellar statistics that are being recognized but rather his character. Campbell is among three players who were nominated for the Lady Byng Memorial Trophy today. The Lady Byng, as the award is referred to in short, “is an annual award given to the player adjudged to have exhibited the best type of sportsmanship and gentlemanly conduct combined with a high standard of playing ability.” Lady Byng first awarded the trophy to Frank Nighbor of the Ottawa Senators in 1925. 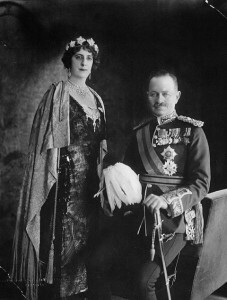 She was the wife of Lord Byng, Canada’s Governor-General at the time, and the couple enjoyed hockey and the Ottawa Senators as frequent attendants at games. As the description from the NHL’s website shows, playing ability is considered, but based on the order in which the criteria are arranged, the award is about sportsmanship and gentlemanly conduct. In a sport that is suffering a black eye from recent violence and vicious hits, it’s nice to award gentlemen. This year’s Lady Byng recipient will be special because he will make history as the first defenseman to win the award since Red Kelly won it in the 1953-1954 season with the Toronto Maple Leafs (in the 1960-1961 season, Kelly won the award as well, but he played that season as a center for the Leafs). That’s a long drought for NHL defenseman, but it is going to end since all three nominees are defensemen – the other two are Jordan Eberle and Matt Moulson of the Edmonton Oilers and the New York Islanders respectively. In fact, in the history of the award, only two defensemen have won it with Bill Quackenbush being the only other one. Quackenbush won the Lady Byng in the 1948-1949 season, and other than 2000-2001 when Nicklas Lidstrom finished second to Joe Sakic, no other defenseman has been close. It’s an award that has been dominated by forwards such as Pavel Datsyuk and Martin St. Louis who together have won the last six. It will be nice to award the Lady Byng to a position that has more gentlemen than obviously have been recognized. Campbell has only 6 penalty minutes this season, which helps his case, but this award is also very much based on reputation, and Panthers fans should be proud that Campbell is considered among the league’s top gentlemen. Until Thursday, we’ll wait to see if Campbell will be a finalist for the Norris Trophy, but in the meantime, let’s take Campbell’s lead and be more gentlemanly.